This Royal Ballet triple bill is a classic example of ‘Chequers Deal’ programming. The attempt to please everyone results in a deeply unsatisfactory collision between works that have no relation to each other. It is like filling a pick ‘n’ mix bag with liquorice all-sorts, vanilla fudge and bittermint chocolates. Individually delicious but only if eaten separately. 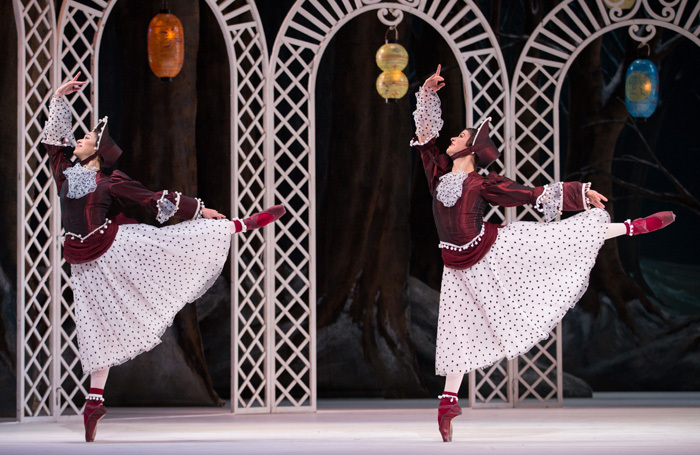 Here we have two comic ballets separated by a gloomy Russian melodrama. The atmosphere created by Ashton’s glorious opener, Les Patineurs, in which skaters of varied ability glide and dance across a frozen pond never fails to delight. Exquisitely costumed in reds, blues and browns, the dancers shift from groups to duos to solos in an endless flow of movement, occasionally stalled by a comic tumble. The filigree steps and intricate patterning of the ensembles illustrates Ashton’s love of pure dance that is neither narrative nor abstract: it just is. Marcelino Sambe’s solos are outstanding in the elastic vitality of his leaps, entrechats that etch the air like cut glass or the fouettes en tournant in which he threatens to drill a hole through the ‘ice’. If Macmillan’s Winter Dreams is not his finest work it offers an intriguing perspective on Chekhov’s Three Sisters. But coming after Les Patineurs it sours the mood created by Ashton’s opener. There is fine work here – the elegant severity of Itziar Mendizabal, the repressed sensuality of Marianela Nunez and the flirty capriciousness of Yasmine Naghdi define the sisters perfectly and the Three Graces tableau that opens and closes the piece offers a totem of dreams unfulfilled. The pathos that aspires to tragedy is well conveyed but it brings the evening down too many levels. The concluding piece, Jerome Robbins’ The Concert – arguably one of the funniest ballets ever made – struggles to lighten the mood in spite of its adroit shift from satire to slapstick surrealism.